Click to Enlarge - I am towards the bottom! A couple weeks ago the IARU HF World Championship 2014 was held. It started at 7:00 AM local time on Saturday morning and ended 7:00 AM local time on Sunday morning. I have been wanting to work a big contest, and I was able to squeeze a few hours of "shack time" into my schedule on Saturday. I hit the ground running on Saturday morning right when the contest started. I did a bit of band hopping for the next 90 minutes. Then I was able to get back on about 3:00 pm local for an hour, then back on again about 11:00 pm local for an hour or so. I worked 55 stations during this limited operating time. I worked mostly stateside stations, but I was able to pick up a couple DX contacts as well. The only HQ station I worked was W100AW - which was a thrill. I also worked stations in Canada, Bermuda, Europe, Jamaica and Brazil. I also worked Hawaii several times, which I had never done before. The good news about my high noise level at the QTH is that if I can hear them, I can almost surely work them. I think I only called 2 people that I did not end up working. I operated "search and pounce" the entire contest. Starting at one end of the band and working my way to the other end. One thing I found interesting is that I would finish scanning from end to end, then start over. On the next pass I would hear stations I didn't hear on the first past. Very interesting! The other thing I was happy to see is that I was not last! I uploaded my scores to 3830scores.com and as you can see in the image above, I was not last. I will officially submit my score to the contest, just to eventually see my call sign in print. This was very fun! I know I will never by a big gun contest station, but contests are a great way to improve your CW speed, operating skills, and have lots of fun! good evening Burke, I too was in the contest but really was not able to make any DX contacts…..conditions sure are changing as I in the past had no problem with my QRP station making DX contacts. 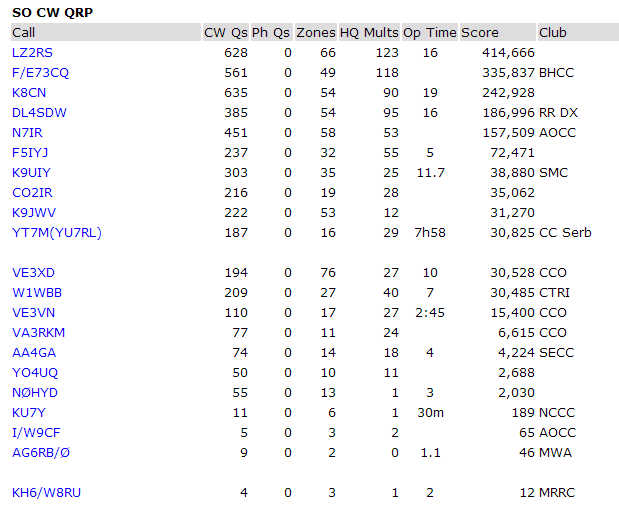 Very good for you for making the QSO's that you did and some DX to boot. I was happy to work the DX I did. I am not sure if it was propogation or the constant S5 noise level here at the QTH that stopped the DX. I just had a bunch of fun working so many stations in short order. Plus when I uploaded to LOTW today I picked up about 12 new states from that contest alone.